Northwest Crossing is located on the west side of Bend, Oregon a county of approximately 7o,ooo people is the environmentally sensitive community of northwest crossing. This 500 acre mixed use green community was carefully planned around protecting the existing beautiful native landscaping and native ponderosa pine, sage brush and juniper trees identifying each of the separate green neighborhoods contained within the community. By preserving the existing trees the community has the look and feel of an older much more established neighborhood. Master planned by a landscape architect utilizing the Oregon native landscape, mountain views, natural land topography, and existing slopes as a smart growth development guide to protect the natural environment. Northwest crossing is one of the North American green communities highlighted in a recent book titled “unsprawl” remixing spaces as places published by plantizen press. Highlighting smart urban growth design principals, revealing successful strategies to replace the typical automobile dependent suburban community constructed since world war two. This pedestrian friendly, walkable community has four parks consisting of thirty two (32) acres, a hiking/biking trail system that connects with an adjacent 500 acre city managed Shevlin park, where families can enjoy the scenic views or a ten minute walk to downtown. These alternate open green space, transportation routes are integrated through out the community to discourage typical automobile dependency. Encouraging an active lifestyle for residents to interact with the natural environment. There is currently 25 carefully selected green certified home builders in the Northwest Crossing, sustainable community. Each of the homebuilders construct green homes to the minimum certification of Earthcraft Which is designed for energy efficiency, sustainable building materials, water conservation, indoor air quality and recycling. or certify to Energy star certification. Several homes in the community are certified to LEED standards, and several homes are constructed to net zero building standard. The community is the 2007 NAHB green homebuilder of the year award. Winner of 2010 Natural home magazine top 10 green neighborhood of the nation. Winner of 2011 environmental center sustainability award and the 2013 top 50 master planned community to retire magazine. Two retail buildings are certified to national LEED standards. In addition the retail buildings have won the 2008 NAHB green building award. Northwest Crossing homeowners can select their individual green homebuilder to construct their residential home of their choice. Residential homes range in size from two bedrooms two baths all the way up to five bedrooms four and a half baths. Home prices start low 300’s and range up to over one million dollars. There is also a large selection of sustainable individual living accommodations available to residents including: single family, multi family, town homes, green condos and apartments. This mixed use development includes: retail stores, speciality shops, numerous restaurants, and three schools, high lakes elementary school which has three consecutive years of exceptional ratings, A William Miller elementary school that has received a LEED gold certification. There is also a Summit high school that has consistently exceeded state and national averages for SAT and ACT scores. There is also festivals, numerous community activities available to all residents, a local farmers market, and a large community garden with 5o families planting and participating in gardening activities. Fruits and vegetables are also shared with local restaurants allowing residents to grow and eat their own local food. A growing green neighborhood activity nationwide! Located three miles from downtown Salem, Oregon, Pringle creek is a 32 acre master planned green community located in the heart of Willamette Valley. The community focuses on connectivity and innovation sharing 12 acres of parks and open spaces offering 70 lots with access to geothermal connectivity and another 100 lots with south facing slopes for excellent solar home site positioning. Pringle Creek derives its namesake from a restored creek that runs through the entire community and is certified as salmon safe allowing residents thoughtful time to connect with nature. Additional community features include: Year round community gardens, networked walking and biking trails through out the entire community, fruit orchards, berry patches, and a local plaza were all the residents socially connect to each other. Future residents have the option of building a custom home on one of the prime lots offered for sale, or purchasing one of the three Leed certified models available. The 1,200 square foot 2 bedroom 2 bath cottage offers a front and back porch, vaulted ceilings for sale at $229,000. The 3 bedroom 2.5 bath 2,100 square, foot Tall home which is fully customizable for sale at $375,000. 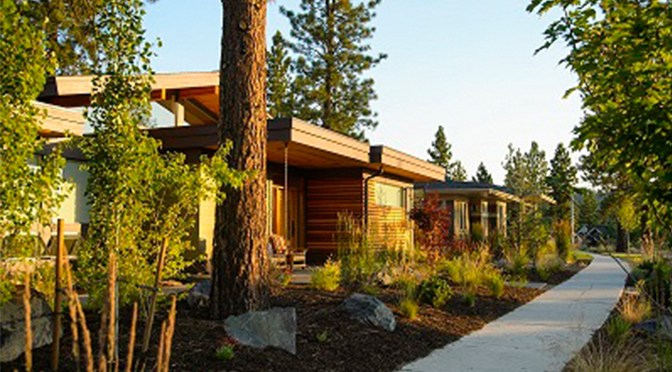 Or the Leed platinum certified, 2,035 square foot four bedroom, 2.5 bath, Net Zero home. This super efficient home comes with a net solar array, high efficiency heat pump, on demand hot water heater, and bamboo flooring. This supper efficient home is for sale at an affordable $375,000. A geothermal loop is constructed under the streets through out the community. With a constant 56 degrees year round temperature all the homes connected to the geothermal loop use a water furnace which is 400% more efficient than a gas furnace for heating and cooling. The community center Pinter’s hall is also connected to the geothermal loop using extra power from the 20 KW rooftop solar array to power the geothermal heat pump system for maximum efficiency! Rain water harvesting is collected used as irrigation, and flushing the toilets at Painters hall. The entire community is designed around nature for healthy living. Eighty percent of all the trees were preserved during the infrastructure phase. Two hundred tons of steel and wood were recycled with environmental stewardship. Two historic buildings were protected with living roofs added. Wetlands were enhanced and protected. A beautiful bridge was reused, concrete slabs were recycled, and all construction vehicles and heavy equipment ran on bio diesel. Pringle Creeks streets are constructed of permeable paving. With no street curbs to allow water channeling, using gravel, native plants and green spaces adjacent to the streets. This Allows 90% of storm water to peculate back into the ground and recycle into water aquifer below. With 9,000 linear feet of green streets and alley ways this is the largest residential application of porous streets in North America! Green streets are more expensive to construct than conventional streets, however this cost is offset by eliminating all drains, gutters and curbs. The green streets serve a dual purpose, functioning as a driving system and a storm water green infrastructure recycling system! In 2016 Pringle Creek was awarded international B corp. certification for environmental, social, and transparency achievements. B Corp. are third party independent certifications similar in nature to Leed green certification for buildings or Fair trade certification to insure equitable practices along the smart supply line chain. B corp. certifications are growing with over 1,600 certifications worldwide in 43 countries! Pringle Creel received 93 points out of a possible 200 points to become certified. The minimum B corp. certification is 80 points. To inquire about our domain names.